President appoints chairs of five various commissions - Integration Through Media ....! KATHMANDU: President Bidya Devi Bhandari has today appointed chairpersons to five various constitutional commissions. The President, on the recommendation of the Constitutional Council, appointed Balananda Poudel the chairperson of the National Natural Resources and Finance Commission, Dr Shanta Raj Subedi the chairman of the National Inclusion Commission, Bijaya Kumar Dutta the chairman of the Madhesi Commission, Bishnu Prasad Chaudhari the chairman of the Tharu Commission and Samim Miya Ansari the chairman of the Muslim Commission. 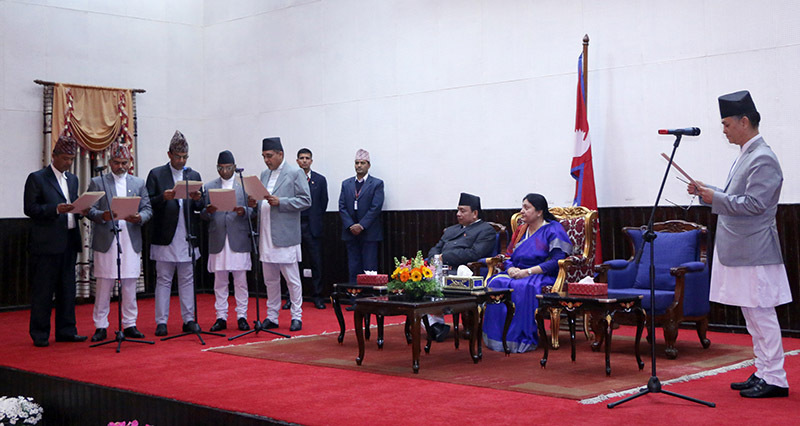 Chief Justice Cholendra Shamsher JB Rana administered the oath of office and secrecy to the newly-appointed chairs in the presence of President Bhandari at a special ceremony organised at Shital Niwas. Vice President Nanda Bahadur Pun; Minister for Law, Justice and Parliamentary Affairs Bhanubhakta Dhakal; Deputy Speaker Shiva Maya Tumbahamfe; heads of constitutional bodies and chiefs of the security bodies; and special class office-bearers of the Government of Nepal were also present on the occasion.